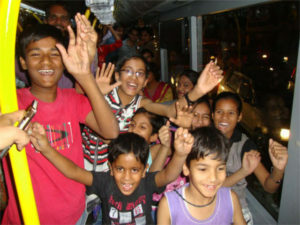 Trial runs launched on the iBus bus rapid transit corridor, Indore, India. Photo by Dario Hidalgo. 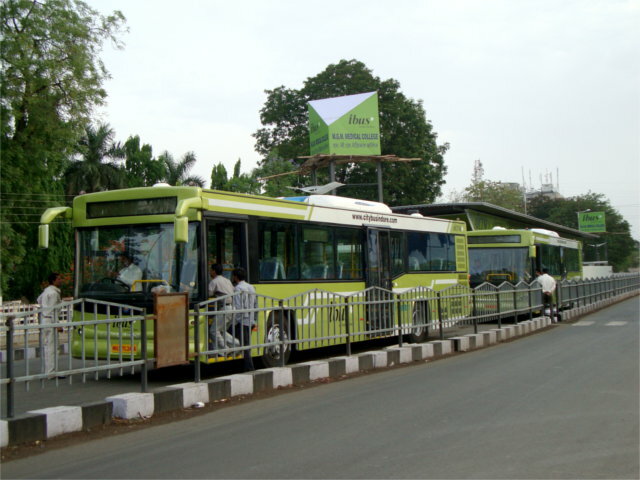 Last month, India’s newest bus rapid transit (BRT) system – iBus – launched trial operations in Indore. Over the last seven years, the implementing agency, Atal Indore City Transport Services Limited (AICTSL) worked closely with several public and private agencies, including EMBARQ India, to bring this project to fruition. The system includes an 11.4-kilometer (7-mile) corridor, 21 median stations, and custom-designed buses, which are expected to serve 70,000 passengers per day. The city of Indore is home to more than 2 million people and is steadily growing. Prior to 2006, when the city transport agency was formed, there was no organized public transport system. Over the years, a city bus service grew to more than 100,000 passenger trips per day, accounting for a little over 4% of total transport in the city. In June 2006, the city’s transport operator, AICTSL, commissioned a detailed project report for the implementation of a 88.4-kilometer (55-mile) bus rapid transit network, to be completed in three phases. By October of 2006, the pilot project — an 11.4-kilometer (7-mile) stretch on AB Road — was submitted to the central government for funding, and construction began in August 2007. The project faced several challenges right from the start — the first of these challenges was funding; of the estimated INR 1.73 billion (USD$ 31.6 million) required for the project, only INR 0.98 billion (USD$ 17.9 million) was approved. Additional challenges arose, in the form of land acquisition negotiations, negative media, illegal encroachments on the corridor, and public interest litigations. The project was further complicated by parallel projects, such as the Narmada Water Supply System project and sewerage installation projects along the same corridor. Despite these setbacks, AICTSL was determined to see the project through. By 2009, AICTSL received funding for the purchase of 50 BRT buses via the Jawaharlal Nehru National Urban Renewal Mission (JnNURM) national investment scheme, and signed an agreement to receive a grant for the intelligent transport system technology required for running the BRT system. Additionally, a decision was taken to install indigenously-developed solar-powered, vehicle-actuated, wireless traffic signals, which will be the first of their kind in the country. Since 2009, EMBARQ India has supported the transport operator AICTSL with technical expertise, including taking key officials on study tours to learn best practices in implementing and operating a BRT system from Bogota’s TransMilenio, and Ahmedabad’s Janmarg BRT systems. Some key outcomes of EMBARQ India’s engagement with AICTSL included identifying the need for comfortable and well-designed bus stations; the re-designing of the corridor to have median-island bus stations, instead of median-offset bus-stops; and the use the gross-cost contracting model for operations, which would make it more amenable for public-private partnerships. Additionally, EMBARQ India, being in an influential advisory position on the project, has provided input on bus procurement, operational planning, financial modeling, fare-systems integration, communications and branding support, and other input on the day-to-day planning and management of the project. In 2012, in response to negative media reports resulting from construction-related accidents and the perception of lost road space for other vehicles, AICTSL and EMBARQ India held several public presentations on the BRT, in which the system was explained in detail and questions and concerns from the public were immediately addressed. These public presentations continued into 2013, and individuals from several local schools, colleges, and corporate facilities along the corridor were invited to a forum to discuss the project. The forums became an excellent platform to understand and inform the public expectations and introduce the city to a high-quality system that has been extensively used world-over. As part of its project outreach, AICTSL also launched a successful social media campaign on Facebook, inviting the general public to ask questions and comment on the various updates of the project. As AICTSL’s CEO, Sandeep Soni said at EMBARQ India’s recent CONNECTKaro 2013 conference, “treating public consultation and outreach as a core activity, rather than an afterthought would result in public understanding, buy-in, and support”. Trial runs are underway along Indore’s new BRT corridor. Several educational tours are being organized for various sections of the public. By mid-May of 2013, the system will be opened to the general public to test and use the system free of charge. It is anticipated that the system will be fully functional by July of this year. 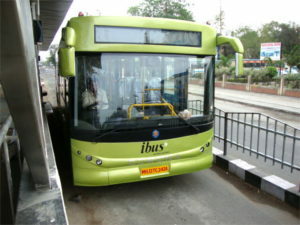 iBus is ready to change the way the people of Indore travel. It will not only improve traffic conditions in the city, but also enhance the overall quality of life for the residents of Indore. How clean is the air we breathe in cities?